Signed and dated, lower left: "Claude Monet 94"
Durand-Ruel & Cie (Paris, France), purchased from the artist, 1895; sold to Louis Gonse, 1895. Source: JPGM, Paintings Department, curatorial files, letter from Paul-Louis Durand-Ruel, June 25, 2001. Louis Gonse, 1846 - 1921 (Paris, France), probably by inheritance to his son, Emmanuel Gonse. Emmanuel Gonse, 1880 - 1954, probably by inheritance to his wife, Suzanne Gonse. Suzanne (Boas) Gonse (Paris, France), sold to Durand-Ruel & Cie (Paris, France), 1962. Durand-Ruel & Cie, sold to Sam Salz, 1962. Acquavella Galleries, Inc. (New York, New York), sold to the J. Paul Getty Museum, 2001. Exposition de tableaux de Claude Monet, exh. cat. (Paris: Galeries Durand-Ruel, 1895), p. 3, no. 13. Venturi, Lionello. Les archives de l'impressionnisme. 2 vols. (Paris and New York: Durand-Ruel, 1939), vol. 1, p. 359, letter 227. Exposition Claude Monet, 1840-1926, exh. cat. (Paris: Galerie Durand-Ruel, 1959), unpaginated, no. 50, ill.
Wildenstein, Daniel. Claude Monet: Biographie et catalogue raisonné. 5 vols. (Lausanne and Paris: La bibliothèque des arts; Wildenstein Institute, 1974-1991), vol. 3 (1979), pp. 166-67, no. 1354, ill.
Seiberling, Grace. Monet's Series (New York and London: Garland, 1981), pp. 367, 369, app., nos. 13, 27. Pissarro, Joachim. 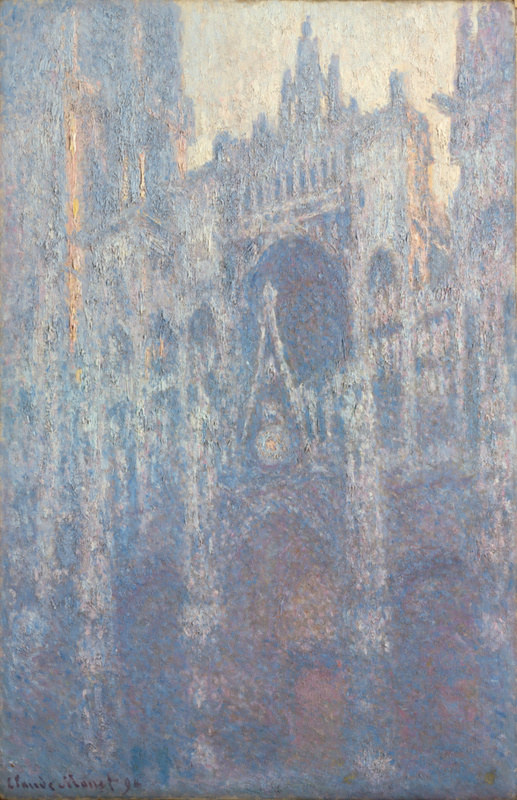 Monet's Cathedral: Rouen 1892-1894 (London: Pavilion, 1990), pp. 64-65, 95, pl. 15. Gonse, François. "Louis Gonse (1846-1921): Historien, critique, et amateur d'art." Mémoire de maîtrise (Université de Paris IV-Sorbonne, 1990), pp. 105-6, 119n61. Grandjean, Gilles, ed. Rouen, les 'Cathédrales' de Monet, exh. cat. (Rouen: Musée des beaux-arts, 1994), p. 97, ill.
Monet: A Retrospective, exh. cat. (Tokyo: Bridgestone Museum of Art, 1994), pp. 176, 178, no. 57, ill.
Wildenstein, Daniel. Monet, or the Triumph of Impressionism. 4 vols. (Paris: Wildenstein Institute, with Taschen, 1996), vol. 1, p. 293; vol. 3, pp. 555, 562, no. 1354, ill.
Allen, Denise, et al. Masterpieces of Painting in the J. Paul Getty Museum. Rev. ed. (Los Angeles: J. Paul Getty Museum, with Thames & Hudson, 2003), pp. 104-5, no. 56, ill., entry by Charlotte Eyerman. Bieber, Susanneh. Variations on a Theme: American Prints from Pop Art to Minimalism, exh. cat. (Fresno: Fresno Metropolitan Museum, 2004), p. 12, fig. 3. Stuckey, Charles. "The Predications and Implications of Monet's Series." In The Repeating Image: Multiples in French Painting from David to Matisse, exh. cat. Eik Kahng, ed. (Baltimore: Walters Art Museum, with Yale University Press, 2007), pp. 120, 121, fig. 53. Kahng, Eik, ed. The Repeating Image: Multiples in French Painting from David to Matisse, exh. cat. (Baltimore: Walters Art Museum, with Yale University Press, 2007), pp. 121, 196, no. 62, fig. 53. The J. Paul Getty Museum Handbook of the Collections. 7th ed. (Los Angeles: J. Paul Getty Museum, 2007), pp. 144-45, ill.
Salomé, Laurent, ed. A City for Impressionism: Monet, Pissarro, and Gauguin in Rouen, exh. cat. (Rouen: Musée des beaux-arts, with Skira Flammarion, 2010), pp. 273, 278, no. 63, ill., entry by Jeanne-Marie David. Acquavella: The First Ninety Years (New York: Acquavella Galleries, 2012), p. 371, ill.
Pissarro, Joachim. "Monet / Pissarro in the 1890s: Serial Racing." In Pissarro, exh. cat. Guillermo Solana et al. (Madrid: Museo Thyssen-Bornemisza, 2013), p. 47, fig. 18. Scoates, Christopher. Brian Eno: Visual Music (San Francisco: Chronicle Books, 2013), p. 119, ill.
Lehmbeck, Leah, ed. Impressionist and Modern Art: The A. Jerrold Perenchio Collection (Los Angeles: Los Angeles County Museum of Art, with DelMonico Books/Prestel, 2016), p. 189, under no. 43, fig. 38. Explore the concept of a sacred place through works of art representing sacred spaces, and by studying the California missions.